Whether you need to connect with a colleague, client, or a supplier, telecommunication has become an essential component of daily work life. Companies are now finding that tech tools and systems can measurably impact critical business objectives — from enhanced team collaboration to more productive sales engagements and recruiting. Today’s typical AV integration projects combine many technologies; not just core and traditional AV devices, but new collaboration tools, networked data services and a wide range of collaboration and communication devices. Monolith Modular Systems’ goal is to bring the latest technologies to clients in order to create best user experiences. Trade shows, conferences and industry events are crucial tools in keeping up with industry trends, new products and technologies. InfoComm 2018 is the first North American show since InfoComm International became AVIXA, with thousands of products for audio, unified communications and collaboration, display, video, control, digital signage, home automation, security, VR, and live events. It took place on June 4-8 in The Las Vegas Convention Center – a 3.2 million square foot facility with approximately two million square feet of exhibit space. 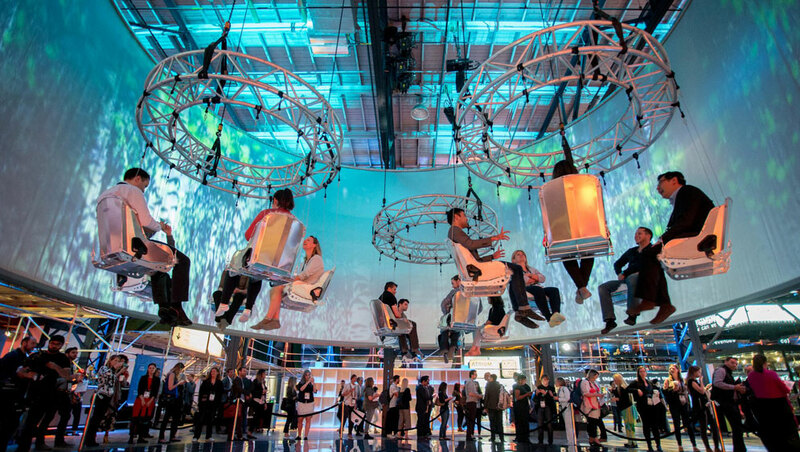 This year, along with technology, InfoComm was focusing on ways of applying human-centered design to AV solutions and creating memorable experiences. That type of content is essential to evolving trade shows, explained AVIXA senior VP of marketing and communication Dan Goldstein, prior to InfoComm 2018. The omnipresence and availability of product information necessitates new trade show elements. “It’s incumbent upon us to offer content that is unique, that is face-to-face, that’s not available online and which places all that technology that you have on the show floor in a broader context,” he said. It’s even more true in the B2B trade show world, Goldstein said as “there’s definitely a shift in the direction of original content.” Vivid examples are The Sky C2 ride and The TIDE Conference.